According to a December 2011 study, "82% of the tablet owners in North America report a willingness to purchase directly on their mobile devices (smartphones or tablets), compared with 76% of smartphone owners"
With this in mind, many are wondering: what the best ways are to reach these mobile consumers? As always when it comes to new marketing strategies, it is helpful to look at the market and see who is already doing it well. 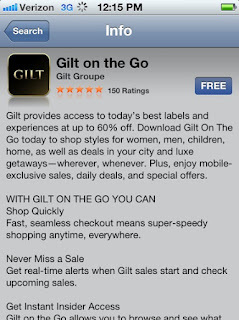 Gilt Groupe was an early adopter of mobile platforms for commerce. Given the nature of their instant, blink-and-you'll-miss-it sales, Gilt "insiders" were the perfect audience for on-the-go mobile shopping. As reported recently by Fashionista, Gilt has been a pioneer in this space, serving as an inspiration to an array of other fashion and commerce sites and apps. Let's take a look at what they're doing right, and what we can learn from it. Back in April of 2010, Yonatan Feldman, vice president of global and mobile engineering at Gilt spoke with The New York Times for the article "On the iPad, Gilt Is for All Kinds of Shoppers" about Gilt Groupe's tablet strategy. According to the article "The goal was to minimize the clicks shoppers make and the number of new pages that load to show merchandise and make a purchase, so more could be done from one page." Do the research to understand how your customers are interacting with mobile (what devices they use & how they’re using them). In more recent months, Gilt's mobile and tablet offerings have continued to evolve with the market. Most recently Gilt City has re-launched its iPhone app, mirroring site improvements, including enhanced location-based services through mobile. From Gilt we can see that there is no one-size-fits-all-platforms answer to mobile. You may need to develop for the ipad differently than for your mobile site. Additionally your platform-specific experiences can both built the brand AND incentivize transactions. To hear more about Gilt Groupe's recent developments, join us this March at The Mobile Marketing Conference. Yonatan Feldman, Vice President, Mobile & Global Engineering, at Gilt Groupe will be presenting "Maximizing Brand Impact in the Mobile Space" on Tuesday, March 10th, 2012. Download the brochure to learn more about his session. Save 15% when you register with code TMMC12DIGITAL here. P.S. Join our social media community! Our new LinkedIn Group is a place to share expertise and brilliant ideas on anything mobile marketing and you can also follow us on Twitter or on Facebook for conference updates and industry insider news.